When you cry with joy and appreciation because you were gifted a beautiful new vacuum! 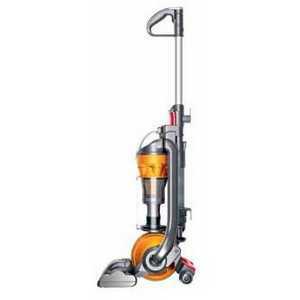 A new Dyson, super swank, compact, AMAZING vacuum, that is SO expensive, I would never even THINK of buying one. I am so grateful for it. It will make vacuuming SO much easier. I am still in shock that my super frugal Grandma splurged on something like this for me. But I am not shocked at all that she would be trying to take care of me in whatever way she can. She is the best (Honestly, I challenge you to find a better woman out there, she is my hero)! I feel a little guilty for telling her about my crappy vacuum. I didn't even think twice about it, and had no idea she was thinking of doing this. There was a big part of me saying, NO WAY! I can NOT accept such a nice gift. This is crazy. But I really, really, really want it. Does that make me a bad person? Whether or not it does, I already used it to vacuum my floor first thing this morning. If I thought I could get her to return it without a big fight, or without offending her, I probably would.﻿ But over time I have learned when to just shut-up and do my best pathetic attempt at conveying how ridiculously grateful I am!! Also, on the same note of what an AMAZING family I have, my incredible mother brought these cross-stitches that she made for my girls. If you have ever done any cross-stitch, then you have an idea how much work (endless hours, dozens, maybe even hundreds) goes into a project like this. I personally don't have the patience for it. But that my mom made them such beautiful, heart-felt, hand crafted pictures makes me SO happy. They are lovely and they also make me want to cry. They will be treasures for my girls forever! I am blessed with such wonderful women and role models in my life. My mom and my grandma are my rocks and make me feel so gushy and sentimental. I hope I can be more like them someday. 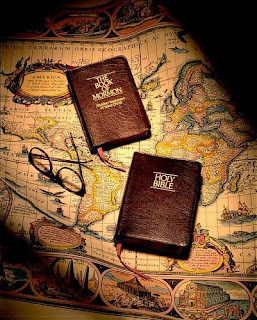 In 2011, I set the goal to read the entire LDS Standard Works, which includes the Old and New Testament, The Book of Mormon, Pearl of Great Price, and The Doctrine & Covenants, before the end of the year. (for information on the LDS Church visit www.lds.org) It is about 2500 pages of scripture. I tried to read about 7 pages a day. Which at times was difficult and other times was easy. I think that holding myself to this personal goal was one of the best things I could've done for myself. I will be honest, the last few months of the year, I let myself get WAY behind. There were some days that I only read a page, and other days that I let the scripture study I do with the girls count as my daily scripture study and didn't read anything toward my goal. Then I would read 50 or so pages to catch up, stay caught up for a few days, and then start getting behind again. I didn't want to find myself reading because I felt coerced into meeting my goal. I didn't want to read with the wrong attitude. So on days when I just couldn't get into it, I read a page or two and put them down, wanting to come back to it when I was ready to really study, and get something out of what I was reading. I will totally make the excuse that during the fall & holiday season, Matt was gone a LOT and I was exhausted and stretched REALLY thin. So there were plenty of days, when I crawled into bed, that I couldn't stay awake long enough to hit my target. However, I DID finish my goal. I wanted to finish it by Christmas, but I didn't. I DID finish by New Years though. I am really proud of myself. It was sometimes hard to make time and through some stretches in the bible it was REALLY hard, there are portions of D&C that made it hard to stay awake sometimes as well. But in general, I feel like my understanding of the Gospel of Jesus Christ grew SO much. More than I could've imagined. I started out wanting to be more familiar with all the scriptures, have a better grasp on the biblical timeline, and be able to do it quickly so that I didn't forget what I had read and so that I could see how the Standard Works as a whole relate to each other. I came away with knowledge that the Gospel of Christ is eternal. The pattern of God continuously reaching out to man, through visions, prophets, angels, scripture, blessings, and destruction, was illuminated so strongly. I felt the connections to ancient traditions, and felt able to understand how thousands of years could pass so quickly to God, and could feel his love and patience in explaining his plan over and over again, as man would quickly dismiss what they have learned, because "we know so much better". There were portions of the scriptures, especially in the Old Testament, but also little bits everywhere, that made me uncomfortable. That I couldn't seem to fit into my perception of the Gospel and into my belief system (I mean, have you read all of Leviticus?). I would ponder and pray about these things. I would look up information in lesson manuals and online. Sometimes my problems with the text were resolved by this, other times they were not. In the end, I would end up choosing to disregard the things I read that bothered me. Some people might think that in doing this I was pulling the wool over my own eyes, or choosing to live in ignorance. Part of my theory is that the people who kept the records of the scriptures weren't perfect. The other part is that none of these instances caused me enough discomfort to discredit the beautiful feelings of peace and joy that the rest of my scripture studying experience provoked. I would look at the bits that came across as wrong to me, and most of them did not effect my day to day religious experience. When I pray about whether or not Jesus Christ is my Savior, whether the Book of Mormon is true scripture, whether or not we have a living prophet, if the principles and ordinances we receive through church and temple instruction are sacred and everlasting, I still get the same answer. YES! In the end, I believe that by trying to live my life as outlined by the Gospel of Christ, being as humble, loving, kind, dedicated, honest, diligent, and hard working as I can is all that matters. The God that I believe in will judge everyone individually, my religious belief system is deeply personal, and I am mostly concerned with having my heart in the right place. I am sure that if I focused enough on the part of the scriptures that bother me, or what one leader/teacher said that rubbed me wrong, it would eat away at my testimony. However, I find myself praying that if the Gospel is true, I will be able to disregard teachings that don't feel right to me, and that aren't an essential part of my salvation. I guess what I am saying is that I feel like I understand the Gospel enough, and have had enough of a person witness through the Holy Ghost on all the major points, that I feel comfortable enough in my own ability to know truth when I hear it. And I am also willing to accept responsibility for seeking out and accepting that truth, and being able to hold to my personal convictions even when others, even of the same faith, may have a different interpretation. I certainly can't say that I fully understand the Gospel. I will always need to be taught and guided by the Spirit and by those around me, from all walks of life and religious perspectives. I still have a lot of humbling that needs to happen, a long with a lot of continuous study and prayer. To sum up, reading the entire Standard Works, in a very short time frame, was the best personal challenge I have ever given myself. I am so glad that I felt inspired to do it. I am sure that if I hadn't been doing it with "real intent" I wouldn't have been able to gain so much from the experience. It strengthened my testimony that, if you truly want to know God, His plan for you, and do your best to seek for wisdom and truth, God will bless you with all those desires, and if after learning these things you desire to love Him and serve Him, He will fill you with enlightenment, understanding, JOY, and PEACE, beyond what you thought yourself capable of. January passed in a lack of sleep/drug induced fog at our house. Sound like fun? It was NOT. The girls and I all got the flu. Twice. It was rough. I literally only left the house twice (for dr's visits) in almost 4 weeks. It was all a miserable blur. We were pretty much zombies. Miserable, whiny, snotty, zombies. On the upside, I did get the blog caught up, what with the being trapped indoors for weeks on end, and all. It's funny, someone said to me during January, "Everytime I read your blog, it seems like you guys are sick". I thought, "really?" But as I looked back on it, I realized that pretty much the only time I stop to blog is if I am stuck home with sick kids! Kinda funny. So I suppose to the reader, we do seem to always be sick, because even though it is sometimes 3 months between, mosts of my posts are done when we are sick! Lol! We didn't do much of anything blog-able in January, EXCEPT for the first week! The first week of January was great! We celebrated Isabel's 3rd birthday (pictures below) by going to the zoo. My brother Charlie, Matt's mom, and Matt's sister Heather and her 2 youngest kids joined us. It was lots of fun! Izzie wanted a Rapunzel (from Tangled) birthday cake. I attempted to make one. I tried, for the first time ever, to do a buttercream transfer. I was unsuccesful. Which stunk. I spent hours doing it (I snapped a picture AFTER I realized that it wasn't going to work, so that you could see it, though it is slightly messed up where I tried to peel it off), only to have to re-do it. I ended up just free-handing it on the cake, after I had lost all patience and just wanted it done, so it ended up sloppy and slapped on there. Izzie didn't care, but I was less than thrilled. Above and below is the icing I made and drew onto transfer paper, then froze. The top of both are messed up from trying to transfer them. Here it is after just free handing it. Rapunzel looks kinda scary. Whatever. Well, in case you hadn't heard its 2012! Happy belated New Year! Here is a cliffnotes version of 2011 in the Earl house! Graduated with his BSN from ASU! Was Accepted into several CRNA (nurse anesthetist) programs and accepted a position at The Mayo Clinic's program in Rochester, MN starting in the fall of 2012. He continued to work in the ICU at St Joseph's hospital for his 4th year in a row. He also worked part time for Eastern Arizona College as a clinical nursing instructor, which he loved! Managed to keep the household running, bills paid, and all of Matt's application materials sorted, sent in on time, etc, while Matt worked full time & attended school full time for the first 1/2 of the year and worked 2 jobs & interviewed all over the country during the second 1/2. Learned the basics of reading and loves to sound her way through new words! Gave us more "works of art" then we could possibly ever have room for, she sure loves to draw! Finished her 1st year of pre-school and started her 2nd! Was a Sunbeam, and participated in her first Sacrament Meeting Program! Continued to be cautious, kind, thoughtful, and kept us laughing with her infectious giggle and her new found sense of silliness that comes from spending a lot more time with friends this year. Turned her selective talking into a HUGE vocabulary! Got into lots of trouble with her crazy, wild-child spirit, while Mom and Dad tried not to laugh as we sent her to the corner! Continued to be a sweet snuggler, a mischevious trickster, our "class clown", a thorn in her big sister's side (constantly teasing and goading her), our little performer/actress, a whole LOT of fun and a whole LOT of work! Became VERY curious, gets into EVERYTHING, can sometimes be naughty, but ALWAYS does so with a big sweet grin on her face. She isn't sneaky or malicious, she is just curious and BUSY! Stayed as blonde as can be! Is a HUGE daddy's girl, loves to snuggle him! Continues to bring a lot of love, giggles, smiles, and more recently temper tantrums, adores her big sisters, and keeps us all very busy! Our family took a trip to Utah in the summer and one to California in the fall. We traveled to Thatcher 5 or 6 times, and in general stayed pretty busy! 2011 was really our first year with 3 kids, since Kate was born in Dec of 2010, and boy did that one extra kid make things more complicated! Matt and I spent the least amount of time together over-all that we have in the past 8 years, due to having such full schedules, and it took me quite a while to adjust to a making decisions/"parenting on my own" mind frame, but in the end it made us all appreciate the time we get to spend together SO much more! We spent the entire year living with Matt's folks, which is a challenge and an immeasureable blessing! I have a feeling that in the future, when we look back, we will view 2011 as a pretty big year! Our last year in AZ, living with Matt's 'rents, last year before Grad school, before we have kids in school (Lily will start Kindergarden in the fall), etc! Overall, it was at times stressful and awful, depressing, an incredibly challenging/hard year (probably our hardest yet), but it was also the year I have felt the most blessed, optomistic, and grateful. I am grateful for all the things that happened in 2011, but I can't say that I am sad to see it go!